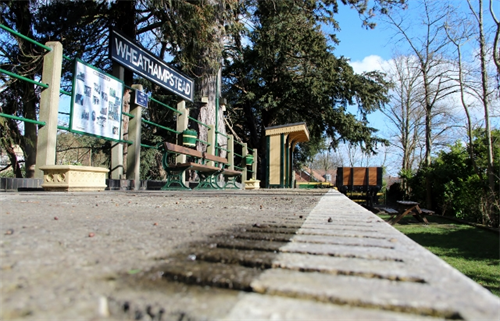 Wheathampstead Railway Station was closed following the Beeching Report on 26th April, 1965 (image on the right was taken just prior to closure). 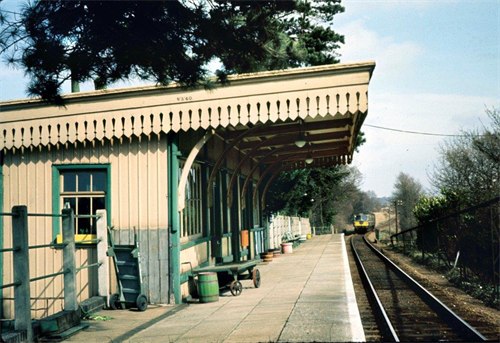 As with many rural villages, the station had transformed the lives of local residents. It lay on a single-track branch line running between Hatfield and Dunstable with through trains from London to Birmingham. Within a few years of closure the tracks, surrounding embankments and station buildings had all been removed to make way for new developments and road improvements. All that was left of the station was most of the platform, high and dry on an isolated embankment raised 4m above the surrounding roads and buildings. Despite being within a stones throw of the village centre, there it lay for over 40 years forgotten and completely hidden by ivy and saplings. In 2009 a group studying the heritage of the village rediscovered the platform remains and decided to restore it in time for the 150th anniversary of it’s opening on September 1st, 1860. This was an ambitious project. The only access was by scrambling up the steep embankment. The tracks, platform slabs, ballast and all other signs of the railway had been salvaged or scavenged at the time of closure. All that remained were the railings, basic platform structure and some of the large edging slabs. Without access for heavy machinery or even water and power, the task seemed hopeless. 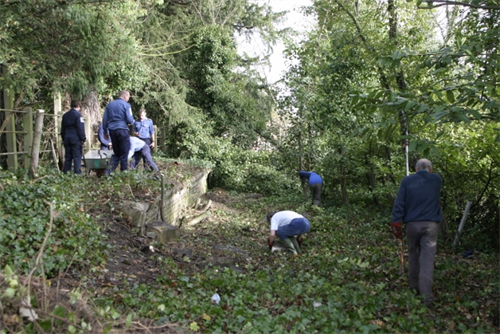 Undaunted, the team raised financial support from businesses, the Parish Council (who own the site) and other groups. Most importantly, all of the work had to be done by hand (just as it was when it was built) so they had to rely on many villagers giving up their free time to clear the site. Wheathampstead is part of St Albans District and a group of sailors from HMS St Albans was despatched to help. Original materials were reused where possible but18 new slabs each weighing a quarter of a ton had to be made by had. By the time of the 150th anniversary of the opening in September 2010, the platform was once again open to the general public. Work has continued since then and a 40 foot section of the original track has been put in place. One hundred and twenty feet of the platform is now complete with signage and access steps, and visitors can see a section of the original Victorian structure uncovered during the work. Being equally ambitious, the project team sought a 5 plank 12 ton wagon to set on the track. Once again, access was the issue and the wagon had to be craned about 100 feet in the air to clear surrounding trees. The wagon was duely restored and opened on the first of June 2014. A Lottery Fund grant has also enabled the team to constuct a shelter in the style of the original buildings to complete the effect. 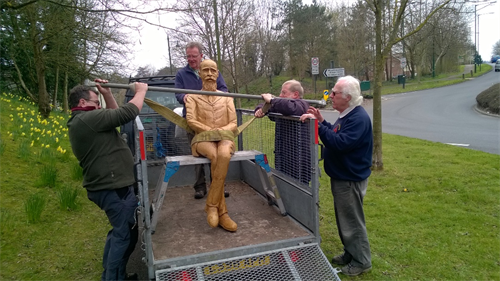 More than 65 years after his death, George Bernard Shaw has been seen again at Wheathampstead’s railway station. The full-sized oak carving has been installed in the shelter on the platform and fans of the author and playwright can have their photograph taken next to the famous man. The picture shows the restoration volunteers carrying the heavy carving up to the platform. The second picture shows the artist (Dave Flemonds of Knebworth Carvings) seated next to the installed statue. George Bernard Shaw was Wheathampstead Station’s most famous traveller, regularly cycling from his home in Ayot St Lawrence to catch the London train. Leaving his bike at the Station Hotel (6p per week) he would collect it on his return and cycle home. If running late, it was not unknown for him to send his chauffeur ahead to ask Mr Lee, the station master, to hold the train until he arrived!